Pakistan has over the past decade been consisted ranked by leading media watchdog groups such as Reporters Sans Frontiers, Committee to Protect Journalists and International Federation of Journalists, as one of the most dangerous countries to practice journalism. The figures bear this out. Over 100 journalists killed since 2000 and over 2,000 injured, arrested, kidnapped and harassed in the same period. In 2013, Pakistan was selected as one of five pilot countries for implementation of the UN Action Plan on Journalists’ Safety and Issues of Impunity, which among other things required a detailed mapping of the state of media safety in the country through a set of about 150 Journalists Safety Indicators (JSIs) and recommendations for collaborative action among government, media industry, media workers, media support groups, parliament and political parties and civil society. Over the course of 2013-14 a detailed mapping of JSIs was undertaken by Pakistan-based research and advocacy organization IRADA with financial and technical assistance of UNESCO and Open Society Foundation. The author of this article was the lead researcher on this effort. The practice of journalism is not pegged to safety of journalists forcing them to assume unnecessary risks in the absence of mandatory guidelines aimed at pre-emption. Media organizations generally don’t have specific security policies, protocols, procedures and practices in place that aim at reducing the risks to journalists. There is an absence of security mechanisms that can aid prevention and curtailment of risks. Instead media houses merely adopt arbitrarily responses to individual cases of attacks. 1a: Promote and facilitate direct dialogue between the key media industry stakeholders such as media owners and working journalists, and federal and provincial governments, including information, law and justice ministries and departments, and their security agencies such interior ministry, home departments and military media wings, to raise awareness about the security concerns facing media. The Pakistan Coalition on Media Safety (PCOMS) can be the facilitative platform for this dialogue. 1b: Facilitate drafting of bills on safety for journalists and media workers, both at the federal and provincial levels, which assist in identifying rights of the media sector and duty bearers of the State that can ensure those rights through pre-emption and responsive measures to reduce risks for journalists and create mechanisms to facilitate legal recourse in proactively combating impunity. PCOMS can be a key platform to facilitate this legislative initiative through engagement with the legislatures and legislators by serving as a bridge between the media industry and the State. There is no governmental strategy in place, either at the federal or provincial levels, which identifies targets and role-players responsible for monitoring, analyzing and responding to issues of safety and security of journalists. 2a: Both the federal and provincial governments should establish a cell and an attendant mechanism, preferably at the information ministry and departments, to serve as the focal platform to engage with media stakeholders and coordinate with the various role-players responsible for monitoring, analyzing and responding to issues of safety and security of journalists. PCOMS can serve as the principal multi-stakeholder platform that can coordinate on the issue of journalists’ safety with the governments. No Pakistani law explicitly deals with or guarantees safety of journalists. The safety of journalists is indirectly dealt with rights and laws guaranteeing safety and security of citizens. Therefore, the State recognizes the attacks on safety of journalists including citizen journalists under the criminal law only. Usually the Criminal Procedure Code (CrPC) is used to entertain cases of attacks against journalists. A bill on safety of journalists has been languishing in parliamentary committees for review and inputs for well nearly two years by mid-2014. 3a: Considering the high degree of violence and impunity against journalists in Pakistan, key Pakistani and international media support groups and alliances, including Pakistan Media Safety Consortium (PMSC), PCOMS and Pakistan Journalists Safety Fund (PJSF) should, in tandem with relevant legal experts draft a model law on safety of journalists for consideration of the federal and provincial governments for enactment. 3b: The PCOMS should spearhead engagement of federal and provincial, legislators and political parties, particularly the standing committees on information in the legislatures, and lobbying for tabling and enactment of the proposed draft model law on safety of journalists. The Pakistani State has no explicit policies, either federally or provincially, outlining protection measures for journalists or media houses, offline or online, or allocation of specified resources and expertise promising institutionalized support to media practitioners attacked or in distress. 4a: PCOMS should engage the federal and provincial governments in a series of dialogues and consultation on drafting, approval and implementation of a specific policy on safety of journalists, which outlines mechanisms of ensuring security of journalists and resources to appropriately compensate for distress in the line of duty. Such a policy should actively encourage institutionalized partnerships between the federal / provincial governments and representative associations of media owners and media workers, plus media support groups, to make such a policy broad-based with multi-stakeholder ownership and division of responsibility. 4b: The PCOMS should spearhead engagement of federal and provincial, legislators and political parties, particularly the standing committees on information in the legislatures, and lobbying for tabling and enactment of the proposed draft model law on safety of journalists. 4c: PJSF, which is an effective and successful but limited mechanism to support journalists in distress, should be strengthened and partnerships between it and the federal and provincial governments, as well as PCOMS, should be encouraged to make it the default mechanism for helping journalists with financial, medical and legal aid to journalists and their families in distress. The federal government in November 2013 announced at a UNESCO conference in Islamabad that Pakistan endorses the UN Plan of Action on Impunity against Journalists that has listed Pakistan as one of the five pilot countries in which it is being implemented. Federal Information and Broadcast Minister Senator Pervaiz Rasheed announced that the federal government is ready to support the implementation of the UN Action Plan through policy and resource support. However, there is no mechanism in place that can help the government meet its commitments. 5a: PCOMS should engage the federal government on discussing and strategizing with it the implementation of the latter’s publicly endorsed UN Action Plan on Impunity against Journalists. This should be linked with similarly proposed activities between these two parties on helping draft a formal government policy on media safety, including a new law on safety of journalists in Pakistan. PCOMS should seek follow-up steps by the government on the commitments made by the government. The Pakistani State does not have specific institutions dedicated to investigations, prosecutions, protection and compensation in regard to the safety of journalists and the issue of impunity. However, some new developments took place in 2014 that can be considered as significant moves on the part of the government authorities in Pakistan – both at the federal and provincial levels – to concretize steps for welfare of journalists, as well as to map out measures that can help in reducing impunity against them. -Federal Government: Established a committee comprising federal information and interior ministers to, among other things, propose in consultation with representatives of journalists and media houses a set of recommendations on providing (i) Legal assistance to journalists in distress, and (ii) Compensation for journalists injured or killed in line of duty. 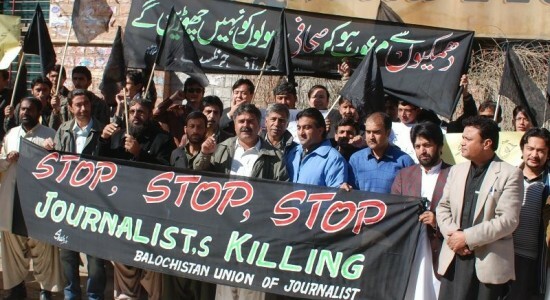 -Balochistan Government: Announced a judicial commission to investigate the killings of journalists in the troubled southwest province since 2010 and a committee to work out a compensation regime for journalists killed or attacked in line of duty. -Khyber Pakhtunkhwa Government: Enacted the Journalists Welfare Endowment Fund Act 2014 mandating the government to take the lead in assuming responsibility to help journalists in distress in the jurisdiction of the province. It promises a fund that will pay Rs1 million payment to the family of any journalist killed in an act of terrorism. -Sindh Government: Announced a plot of land free of charge to the heirs of every journalist killed in the province in line of duty and to partially contribute to health insurance cover scheme for journalists in Sindh. Also announced an ‘endowment fund’ for journalists to help them meet financial needs, including those related to fighting various pressures including attacks on journalists and victimization of media groups. 6a: The federal and provincial governments have taken initial steps that conceptually acknowledge their responsibility and commitment to helping journalists in distress and getting justice for those killed or harmed. However, these are not part of any formal policy on media safety and not even in written forms. Representative alliances working on media issues such as PCOMS and PJSF need to immediately engage these governments in helping then codify these decisions in the shape of written policies, mechanisms and procedures to institutionalize them. 6b: PCOMS and PJSF should provide technical assistance to the federal and provincial in governments in institutionalizing the proposed governmental assistance mechanisms and operationalize these mechanisms through formal partnerships between them and the governments. 6c: The media safety and assistance measures provided by the various governments vary in their respective scopes, scales and systems. PCMOS and PJSF should lobby with and provide technical assistance to the governments to bring uniformity in both the scale and scope of the proposed assistance but also in the eventual assistance delivery systems and mechanisms. The Pakistani State does not, either at the federal or provincial levels, have adequate mechanisms, including specific institutions, programs and budgets, in place for monitoring and reporting upon threats, harassment and violence towards journalists – including arbitrary arrest, torture, threats to life and killing. Any support that is forthcoming from government authorities is arbitrary. Some commitments have been made by the federal and some of the provincial governments in 2013 and 2014 about their willingness to offer administrative and other resource support but this has been absent despite increasing cases of attacks against journalists and media houses. 7a: The absence of a formal policy on media safety has hampered implementation of the willingness and commitments on assistance measures and resources by the federal and provincial governments for journalists. PCOMS should provide technical assistance to the governments to draft and enact such policies. These policies should outline the attendant implementation mechanisms, procedures and regulations. 7b: Considering the high levels of violence and impunity against journalists in Pakistan –– a sub-committee set up by PCOMS in March 2014 to recommend measures to provide justice to these journalists, proposed the appointment of special prosecutors with special offices, staff and budgetary allocations dedicated to proactively investigating attacks on journalists as soon as they happen. PCOMS has already endorsed these recommendations, which also suggest that the prosecutors simultaneously investigate the over 100 unsolved cases of journalists killed and pursue these cases in courts. PCOMS should immediately start lobbying with the federal and provincial governments to appoint these prosecutors and establish their offices, staffs and allocate appropriate budgets to combat impunity against journalists. 7c: PCOMS should help draft a model law on safety of journalists through relevant legal experts and necessary consultations with stakeholders, and lobby with the federal and provincial governments to present the bill in the legislatures for enactment. 7d: A sub-committee set up by PCOMS in March 2014 to consult and recommend a set of proposed safety protocols that media houses could endorse and adopt. These safety protocols, aimed at using preventive and pre-emptive measures to reduce risks for journalists, should be endorsed and adopted by the media houses. Endorsed by PCOMS, the PCOMS should actively lobby to get these implemented.